New Theatre opened its production of Jorge Ignacio Cortinas’ Bird in the Hand at the Roxy Performing Arts Center on March 22, 2013. In this wry comedic play, an adolescent Felix recalls working summers at his father’s tropical-bird theme park in Miami, where imported flamingos serve as a metaphor for his feelings of entrapment, estrangement and disconnection. Through movement, video and sound, the birds played by actors help Felix reconstruct foggy and embellished memories of his past. Ricky J. Martinez & Steven A. Chambers directed a cast that included Ivan R. Lopez, Gabriel Lose Bonilla, Michelle Antelo, Vanessa Thompson,Fidel Urbina, Sammantha Hernandez and Kristina Abreu. (a) melding of ludicrousness and loveliness echoes throughout Jorge Ignacio Cortinas’ tale of one young man recalling his last gasp of adolescence before graduating from high school into the real world of responsibility. Awash in an acerbic and intelligent drollery, it’s Holden Caulfield and Thomas Wolfe as reinterpreted by Carl Hiaasen. Co-director Ricky J. Martinez and Steven A. Chambers have led the cast in finding Cortinas’ wry and wacky groove... The script is a bit confusing and the actors are not seamlessly convincing throughout the entire play. But thanks to Cortinas, Chambers and Martinez, Bird in the Hand is an intriguing little hoot. Save some credit for Antoinette Baldwin’s costuming of those wacky flamingos and Amanda Sparehack’s fluid lighting. And those flamingos are Fidel Urbina, Sammantha Hernandez and Kristina Abreu. 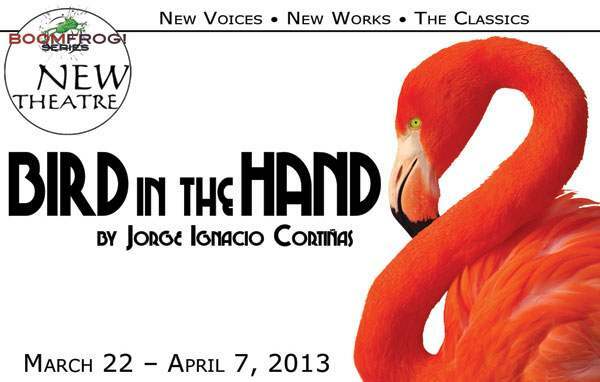 New Theatre presents Bird In The Hand at the Roxy Performing Arts Center through April 7, 2013.